When are Contact Lenses Deemed “Necessary”? What Classifies Necessary Contact Lenses? Necessary contact lenses are a designation based on criteria set by a third-party payor, such as Vision Service Plan (VSP) or EyeMed Vision Care. Each plan has different criteria for qualification. The approval process involves the practitioner’s office submitting and attesting to specific documentation after a patient’s eye exam. When contact lenses are approved as necessary, the cost of the lenses and services is defrayed, sometimes completely. This can save patients hundreds to even thousands of dollars each year. Just about any type of contact lens can be deemed necessary. For example, the lenses may include various replacement schedules ranging from daily disposable (single-use), two-week, monthly, quarterly, to annual replenishment. Necessary contact lenses can also include various types of lens designs, including soft spherical, toric (for astigmatism), piggyback, multifocal and monovision, hybrid, rigid corneal, rigid scleral, and prosthetic lenses. 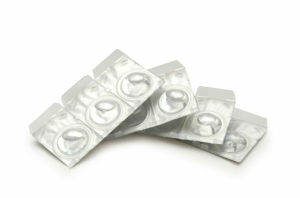 The kind of contact lens prescribed does not determine if it is necessary. What matters is if there is a specific eye condition that fulfills the vision plan’s criteria for necessary contact lenses. That said, a disproportionate number of patients wearing contact lenses for medical eye disease have custom-caliber lenses, including rigid scleral contact lenses. The criteria for necessary contact lenses are nuanced and sometimes complex, so it may require a practitioner and staff that routinely processes these claims to identify situations that would be otherwise overlooked to qualify for necessary contact lenses. Just because you want to avoid out-of-pocket cost does not mean that your lenses can be deemed necessary. There must be adequate justification and documentation, along with a provision by the vision plan for this allowance. There are two types of necessary contact lens claims: for visual- and medical-necessity. Visual necessity exists when glasses cannot provide a desirable outcome due to predictable optical side effects. Medical necessity exists when there is an underlying medical eye disease or condition, such as keratoconus, corneal transplantation, corneal scarring, Sjögren’s Syndrome, ocular graft-versus-host disease (GVHD), neurotrophic keratitis, trichiasis, or Stevens-Johnson syndrome. Visual necessity can occur if the degree of lens power is great (“high ametropia”) where the glasses make the world look abnormally large (image magnification) or abnormally small (image minification). Visual necessity can also occur if there is a sizeable asymmetry (“anisometropia”) in the eyeglass prescription between the right and left eyes, which causes an intolerable size difference between how each eye sees the world (“aniseikonia”) or causes double vision when looking off-center (“induced prism”). The first step to know your candidacy for necessary contact lenses is to schedule an appointment with your eye doctor. At that time, you will learn about your treatment options and any potential out-of-pocket costs should you proceed forthwith contact lens treatment. ReVision Optometry is the first practice in San Diego built from the ground up to provide services to patients with visually-necessary and medically-necessary contact lens needs. The practice is independently owned and directed by Brian Chou, OD, FAAO, FSLS. Dr. Chou previously established and directed a specialty-contact lens clinic in northern San Diego, 4S Ranch, which in 2017 was acquired by a private-equity affiliate. Over one hundred eye care practitioners refer their visually- and medically-necessary contact lens patients to him for specialty care. To schedule an appointment, call 619-299-6064 or visit revisionoptometry.com.